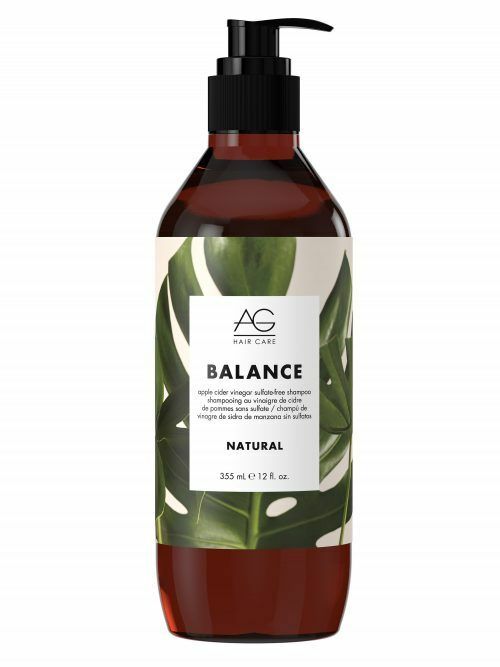 AG's Balance from the new Natural collection is an apple cider vinegar sulfate-free shampoo that is formulated with over 98% plant-based and naturally-derived ingredients. This AG hair shampoo gently cleanses the hair and scalp and gives a beautiful shine to the hair. Organic argan oil and aloe vera also helps to smooth and moisturize all hair types. Hair type & condition: All hair types. Usage Instructions: Massage into wet hair. Rinse and repeat if needed. Organic apple cider vinegar (ACV) – naturally lowers the pH of the hair; hair feels more manageable, shinier, less frizzy and overall healthier looking. Organic argan oil – rich in antioxidants and vitamin E keeping hair smooth and soft. Organic aloe vera – packed with vitamins and minerals; moisturizes and calms the skin. Acacia concinna fruit extract – a mild cleansing agent. Desert date (balanites aegyptiaca) – moisturize and nourish hair. Essential oil fragrance blend – rosemary, lemongrass, clary sage and lavender. AG hair brand develops its own hair care products in Vancouver, and the same entrepreneurial, family-owned spirit that made the company successful from the start is very much a part of AG hair’s culture today. AG hair's hair care products are made with a selection of natural ingredients, ensuring they are gentle on hair but that they also deliver results. If they don’t believe in the integrity of the ingredient, simply put, they won’t use it, which is why they leave out common ingredients like salt, paba, parabens and DEA. Proven hair care products and innovation are AG hair’s passions. With 25 years of experience, AG hair understands the complexity and intricacies of different hair types and our labs are constantly researching new solutions that both work and are good for your hair. All orders are shipped standard or expedited through Canada Post. Receive free Standard Shipping within Canada for purchases of $100+, excluding taxes. Please note: Estimated time of delivery is subject to change. Estimated shipping days start counting when a "Shipped" confirmation email is received. We will happily exchange or refund (in original tender) regular-priced and new merchandise within 14 days of the shipping date from Le Petit Spa. (Mail or in store return). Merchandise must be unopened, unused, in the original condition and packaging, and accompanied by a valid receipt. Shipping charges for returned products are non-refundable. All nail polishes, makeup and hair products are final sale. For hygienic reasons exchanges and refunds are not permitted on these items. Sale items are final sale and cannot be exchanged or returned.